There are a few types of cancer that can affect your eye, but cancer of the eye is very uncommon. Cancer can affect the eyeball itself (intraocular), or the structures and tissues surrounding it (extraocular). Some cancers start in or around the eye, while others travel to the eye from other parts of your body. Around 750 people get eye cancer each year in the UK. Some rare types affect very young children, but it’s mostly adults who get eye cancer. Nearly half of those who get eye cancer are over 65. If you have eye cancer, your tests and treatment will depend upon what type you have. We have some general information about eye cancer here, but your doctor will be able to discuss what’s best for you in your circumstances. Cancer in the eye may develop within your eyeball or within the tissues and structures around your eyeball. Cancer may also spread to your eye from other parts of your body. Eye cancers within the eye include the following. Melanoma of the eye (ocular melanoma). This is a cancer which starts in the melanocytes – cells which make pigment or colouring. Although rare, melanoma is the most common type of eye cancer in adults. You may hear it called ‘uveal’ melanoma because it affects the middle layer of the eye which is known as the uvea. 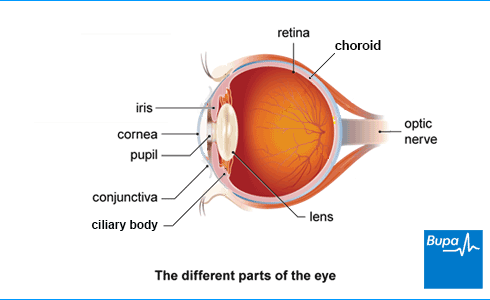 The uvea is made up of the choroid, the iris and the ciliary body. Lymphoma. This type of cancer usually develops in lymph nodes. Lymph nodes are glands throughout your body that are part of your immune system. However, lymphoma sometimes develops in your eye. Retinoblastoma. This develops in the retina, which is at the back inner surface of the eye. It can affect one or both eyes. It’s often inherited and develops in young children, usually the under fives. Over nine out of 10 children with retinoblastoma are cured with the right treatment. Eye melanoma usually develops within the eye, as stated above. However it can also form on your eyelid or your conjunctiva (the thin membrane covering your eyeball). Your eye is surrounded by lots of different types of tissue including skin, muscles and nerves. Rarely, cancers can develop in these structures just as they can in other parts of your body. For instance you can get skin cancers around your eye. See our topic on skin cancer for more information. Sometimes, a cancer in another part of your body can spread and cause a new tumour in your eye. This is called a secondary cancer. This can happen for instance with breast cancer and with lung cancer. It’s actually more common to get a secondary cancer in your eye than have a new cancer start there. Symptoms of eye cancer vary depending on the type of cancer you have and where it’s located. If you have a cancer within the eyeball, such as ocular melanoma, you might not have any symptoms. This type of cancer is sometimes found in a routine eye examination. These symptoms aren’t always caused by eye cancer, but if you have any of them, see your optician or GP. If your child has retinoblastoma, you may notice their eyes are not quite aligned with each other. Or their pupil may sometimes look white instead of black. You may notice this especially in photographs taken with a flash, where people often get ‘red eye’. Your child may have one red pupil, but the other may appear white, or sometimes black. Their eye may also be red and inflamed. Again, having these symptoms doesn’t mean your child has retinoblastoma. But if you notice them, you must have your child’s eyes checked by an optician or their GP. Your optician or GP will ask about your symptoms and examine your eye. They may also ask you about your medical history. If your optician or GP thinks that you may have eye cancer within your eyeball (intraocular cancer), they’ll refer you to an ophthalmologist. This is a doctor who specialises in eye health, including eye surgery. If your ophthalmologist thinks you have eye cancer, they may refer you to a specialist centre. There are only a few of these in the UK, so you may need to travel. You might have the following tests to confirm whether you have eye cancer. Eye examination. Your doctor or optician will shine a light into your eye and look inside with special hand-held instruments. Your doctor may put drops into your eyes that can affect your vision for a short while. Ultrasound scan. Your doctor will move a small ultrasound sensor over your closed eyelids or on the skin around your eye. An ultrasound uses sound waves to produce an image of the inside of your eye. Fluorescein angiogram. Your doctor will inject a dye into your arm that will travel through your bloodstream to the blood vessels in your eyes. This dye will show up on photographs so your doctor can look at the blood vessels in your eyes. Biopsy. Doctors can often diagnose eye melanoma using the tests above, but sometimes they may recommend you have a biopsy. Using a fine needle, your doctor will take a sample of the fluid inside your eye or on the surface around your eye. This will be sent to a laboratory for testing. Your doctor may recommend other tests to help plan any treatment you need, or see how well treatment is working. If so, they’ll explain what each test is for, and what it involves. If you have any questions about your tests, you can ask your doctor. If your GP thinks you might have skin cancer around your eye, they may refer you to a dermatologist. A dermatologist is a doctor who specialises in skin conditions. See our skin cancer topic for more information. Your treatment will depend on the type of eye cancer you have, its size, whether it’s spread, and your health. Treating eye cancer is a very specialist area, so we’ve only given a simple overview here. Your doctor will explain your treatment options in detail and help you make choices. Feel free to ask any questions you have so you understand what your options are. There are three main treatments for eye cancer – surgery, radiotherapy and chemotherapy. Surgery removes cancerous tissue. Often your surgeon will need to remove only the tumour and a small amount of healthy eye tissue, such as your iris. They will try to save your eye if possible. However, your surgeon may need to remove your whole eyeball, which is called enucleation surgery. This may be needed in up to one in three people with eye melanoma. If you have your eye removed, an artificial, or prosthetic, eyeball can be created to match your remaining eye. Your surgeon will probably also fit a permanent implant during your surgery. This sits permanently in your eye socket, filling the space and supporting your artificial eye. See our FAQs below for more information about how losing an eye may affect you. Some types of eye cancer, such as small melanomas of the eye, can be treated with special laser therapy. This uses an infrared laser (beam of light) to destroy the cancer cells. See our FAQ on laser surgery below for more information. Doctors may use radiotherapy, sometimes together with surgery, to treat eye cancer. Radiotherapy uses radiation to destroy cancer cells. Sometimes, small pellets of radioactive material will be put in or near your tumour. This is called brachytherapy. Or a beam of radiation is targeted at the cancerous cells, which shrinks the tumour. Radiotherapy, especially brachytherapy, is often used to treat melanoma of the eye. The length and form of your radiotherapy treatment will depend on what type of eye cancer you have and how severe it is. Your doctor will discuss with you what’s best in your circumstances, and will explain what happens during your treatment. See our FAQ below for more information about how radiotherapy to your eye may affect you. And see our separate page on radiotherapy for more general information. Chemotherapy is a treatment to destroy cancer cells with medicines. Chemotherapy can be effective for treating lymphoma of the eye and retinoblastoma. It’s only used for melanoma of the eye if other types of treatment haven’t worked and the cancer has spread. Chemotherapy is usually given into your vein using a drip. Sometimes it may be given as tablets. Side-effects of chemotherapy can include losing your hair, feeling sick, feeling tired and having diarrhoea. Ask your doctor for information about the type and length of treatment you need and the side-effects you may have. And see our separate page on chemotherapy for general information about this type of treatment. We don’t yet fully understand why people develop eye cancer. The most common form of eye cancer in adults is eye melanoma. Although it’s not really clear, some of the reasons why you might be more likely to develop this are listed below. Having eyes that are a pale colour – blue, grey or green. If you are older – most people who get eye cancer are over 50. If you are white, with fair skin. If you have unusual brown spots in your eye. If you have lots of unusually shaped or large moles. Being exposed to sunlight might be a cause. So going out in the sun too much without protection may increase your chance of eye cancer. Young children may get a form of eye cancer called retinoblastoma. In about four out of 10 children with retinoblastoma, it’s caused by a faulty gene. Often both eyes are affected. It’s not known what the cause is in the remaining children. Being diagnosed with cancer and facing treatment can be distressing for you and your family. An important part of cancer treatment is having support to deal with the emotional aspects as well as the physical symptoms. Specialist cancer doctors and nurses are experts in providing the support you need. Talk to your doctor or nurse if you are finding your feelings hard to cope with. Everyone has their own way of coping. But for further support and advice you may find it helpful to contact one of the well known cancer organisations or visit their websites. They have information about most types of cancer – often in more detail than we can go into here. Some have a telephone helpline you can ring, or an online forum you can join for a chat with others in your position. There may also be local groups where you can meet other people with similar medical issues, or other carers. Your cancer team or your GP practice may know of some. See our section ‘other helpful websites’ below for contact details of relevant organisations. You may also find our general cancer articles helpful, and we have a lot of useful tips and hints on dealing with cancer in our health blog. Will eye cancer surgery change how I look? Will eye cancer surgery change how I look? It’s natural to feel concerned about the way you’ll look after eye cancer surgery. How much it will affect your appearance depends on the type of surgery you have and how much tissue your surgeon has to remove. The amount of tissue your surgeon will remove depends in part on how far the cancer has spread. Advances in surgery and reconstruction mean that scarring is often less of a problem than it used to be. Surgery for treating eye cancer can sometimes leave you with very little scarring. Over time, some scars can fade and become less noticeable. Your surgeon may only need to remove part of your eye. But they may need to remove your entire eye – this is called enucleation. They can usually leave your eyelids, brow and surrounding skin in place. If your surgeon has to remove your whole eye, they will fit an artificial eye a few weeks later. Advances in eye surgery and prosthetics mean that artificial eyes can look very similar to real eyes and even have some movement. Specialists work hard to match the appearance of the artificial eye closely to your real one. You may find that only close family and friends really notice your eye is different. Have a chat with your doctor about your treatment options and how each one will affect your appearance. And see our section on help and support above. How will losing an eye affect me? How will losing an eye affect me? Having one eye may take some time to get used to – both physically and emotionally. Sight changes can affect your ability to read, drive and do certain tasks. This will improve with time. Losing an eye may also affect your confidence and interactions with others, especially at first. How much having your eye removed affects your life may depend on how much vision you had in the eye beforehand. You may find that sight changes affect your ability to read, drive and do certain tasks. You’ll find it hard to judge distance for a while and you won’t be able to see as far to each side as before. Take extra care when crossing roads, and see our FAQ below about driving after losing an eye. You’ll find changes in vision get easier to manage, but it will take time and patience. Most people who have had an eye removed can continue with their same jobs and activities afterwards, and live normal lives. After having an eye removed, it can sometimes feel as if the eye is still there. You may see things that aren’t really there, called visual hallucinations. This is a normal reaction and over time will stop happening. Losing your eye may affect your confidence and interactions with others, such as eye contact. You may feel angry, depressed or worried about your appearance. Over time, and with the help of others, these feelings are likely to improve. See our FAQ above about changes in your appearance after eye cancer surgery. After your operation, allow yourself time to adjust. Take time off work and get used to everyday living. You might find it helpful to wear glasses or sunglasses at first if you’re concerned about your appearance. Losing an eye is a big change for you to cope with. Your cancer doctor and nurses will help. And you may find it useful to read our section on help and support above. You’ll find a lot of very helpful information about how losing an eye might affect you from the website of Cancer Research UK. Can I drive if I lose an eye? Can I drive if I lose an eye? Often, yes, but it depends on your vision in the remaining eye. You’ll need to wait until you have adjusted to seeing with only one eye before driving. You must inform the Driver and Vehicle Licensing Agency (DVLA) and your motor insurer. If you’ve had an eye removed, you’ll find it harder to judge distance. This may affect your driving. By law you must inform the DVLA of your altered vision or you could be fined. You should also let your motor insurer know. To drive legally, you need to meet the visual standards for driving set out by the DVLA. These include being able to read a number plate from a distance of 20m and having an adequate field of vision. Your field of vision is the size of area you can see when looking straight ahead. If you have only one eye, you need to have a full and unimpaired visual field in the remaining eye to drive a car. If you drive a lorry or a bus, the rules on eyesight are stricter. You are not allowed to drive a lorry or a bus if you can only see through one eye (monocular vision). Your optician or ophthalmologist will be able to test whether you meet the DVLA's visual standards for driving. If you don’t, you shouldn’t drive. If you have an accident, you could be prosecuted and your vehicle insurance may not cover you. Remember, only drive once your doctor or optician agrees that you have adapted to your altered eyesight well enough. How will radiotherapy for eye cancer affect me? How will radiotherapy for eye cancer affect me? Having radiotherapy for eye cancer can cause some side-effects. Most of these are short term and will go away soon after you stop your treatment. However, some side-effects may last longer or appear years after treatment. Ask your doctor to explain possible side-effects you may have. Radiotherapy uses radiation to destroy cancer cells. A beam of radiation may be used to target the cancer cells in your eye. Alternatively, a source of radioactivity will be put in your eye (brachytherapy). This radiation can also damage nearby healthy cells, causing side-effects. Temporary side-effects you may have are listed below. Losing your eyelashes. These will grow back after you stop having radiotherapy. Swelling in your eye. Your doctor will offer you eye drops or steroids to help control this. Tiredness. This may carry on for a while after you stop having radiotherapy. Radiotherapy can sometimes cause long-term problems, such as those listed below. Reduced tear production. The radiation may damage your tear gland and you may need to use eye drops to prevent sore and dry eyes. Cataracts. The radiation can cause your eye lens to become cloudy and make it hard to see. This may happen years after having your treatment. You may need surgery to remove the cataracts. Scarring. Radiation can cause changes to your skin. Ask your doctor for more information about the side-effects of radiotherapy. Can my eye cancer be treated with laser surgery? Can my eye cancer be treated with laser surgery? Possibly. Whether or not laser therapy is an option for you will depend on the type of cancer you have and how far it has spread. Laser therapy uses a high-energy beam of light to destroy cancer cells. Transpupillary thermotherapy (TTT) is a form of laser treatment that uses infrared light. It can sometimes be used to treat small eye melanomas. Before it’s carried out, an eye drop is used to dilate your pupil so the laser can be safely directed to the tumour. You can usually go home a few hours after the treatment. You may need several sessions of treatment to make sure the cancer has been destroyed completely. This form of treatment might not work well on its own, so it’s usually combined with radiotherapy. Speak to your doctor if you’d like more information about laser surgery. They’ll be able to let you know if it’s an option in your particular circumstances.